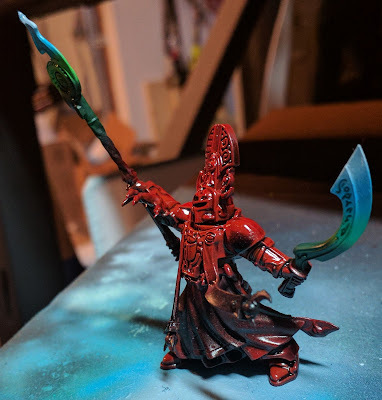 I got some time to make a little progress on the sergeant for my Thousand Sons squads. I worked through the force weapons, transitioning from red to green and finalizing with blue. The blue is intended to represent the gradual shift to Tzeentch. 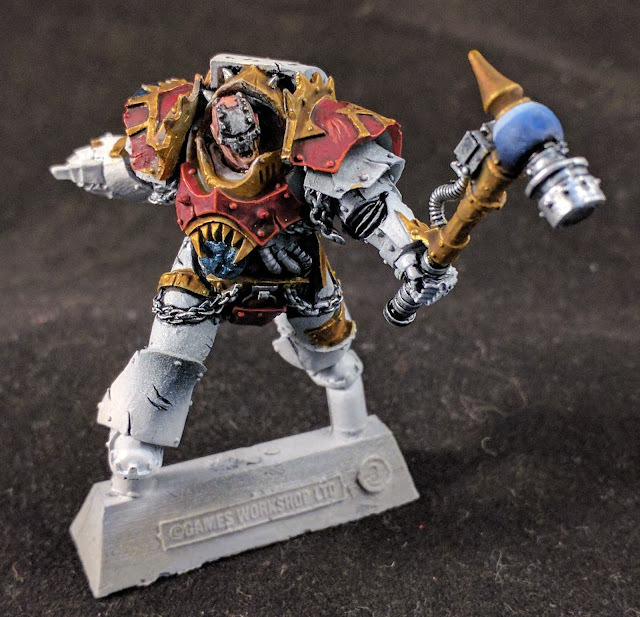 I even used this effect on my Sekhmet Tartaros Terminators. 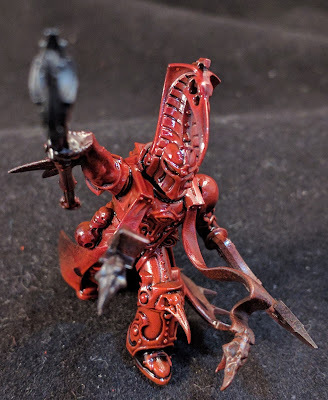 So you might remember a few weeks ago I posted about my recently completed Red Butchers with a double chainfist Devourer. Well I was looking around and noticed that my guy was the same as everyone else. Being the tinkerer that I am I decided to switch up my Devourer to be armed with a chainfist and thunder hammer. Below is a WIP of the progress so far. Not a very big departure from the original, below. And here is a few pictures I have took while I was working on this guy. After working through the greys and into the whites, I switched to working on the reds. Then I started to develop the skin tones. Now this time I worked through the metallics, blue steel, silver and brass. I did notice that the skin work was a shade too close to the brass, so I deepened the red and darkened down the face plating. Crunchy McCrunchie-Face is complete, so now he needs to get to the fight. For this fight his steed will be a ForgeWorld Dreadnought Drop Pod. Now a bit of forewarning, this ForgeWorld Miniature is one solid chunk of resin. Word is they don't sell these bad boys, anymore. No listing on the site. Did somebody say, plastic re-make in the works? I posted this one on G+ a few days ago. 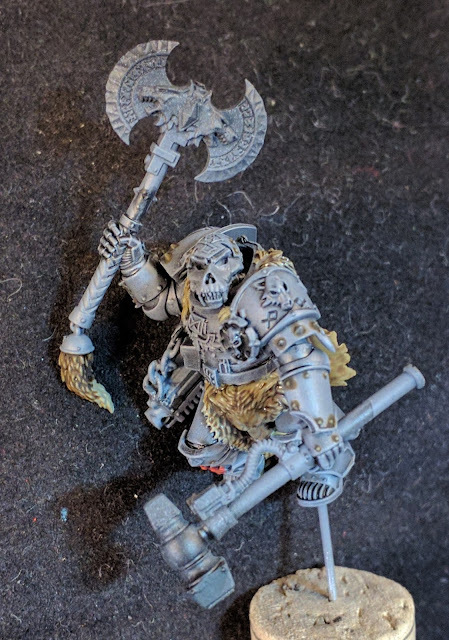 A WIP Praetor VI Legion, kit-bashed from the Geigor Legs, Wulfen Shoulder Pad, Space Wolves Accessories Sprue Axe, Kromlech Torso and a KT Studios - Liber Daemonica Wolf Helm. The bolter and chain was converted from jeweler's chain and a Chaos bolter. The intention is that this fellow will lead my VI Legion forces and replace my current Cataphractii Praetor. More details as I find time to finish him off. Geigor meet Krom. 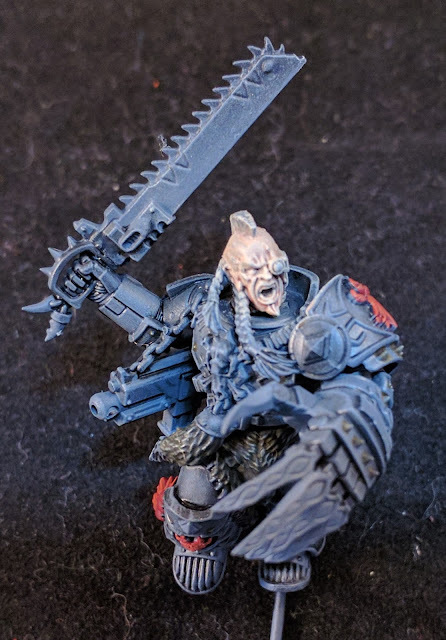 Well actually meet the new WIP Sergeant for my assault squad. Blocking in the colors has begun and I have even started working on the face. So the 'NOT' 40k end times is coming. And with it dropped a bunch on tasty new miniatures. Really shiny miniatures. Very shiny miniatures. In fact so distracting that I just had to give them a burl and try my hand painting them. 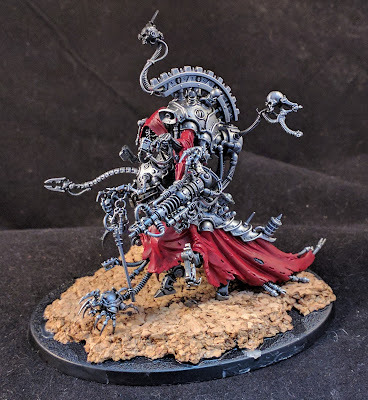 Here is my start on Belisarius Cawl. And while I was waiting for the red to dry, I started on Inquisitor Greyfax. I left her head and legs off just so I could into do the cloak and tabard properly. I will update as I find time to tinker with these guys. 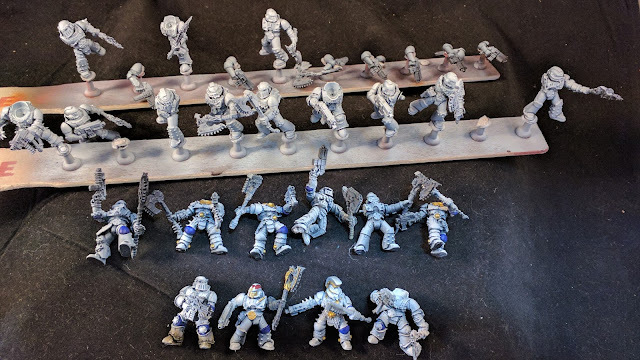 I have been trying to find inspiration for finishing a large squad of World Eaters. Well, not really lacking inspiration, more just losing focus. Too many shinnies syndrome, I guess. Lots of white just begging for some blue and gold. Just need to focus. And then a good drenching in blood, right ? Recently Feldmaster created and successfully completed an Indiegogo Campaign (Recent Indiegogo Campaign) to fund the creation of the Army-Case or A-Case, and I was lucky to get in on this and get my hands on a Victory Case. Often I am interested in how an item rates, so below is my review of the Victory Case. 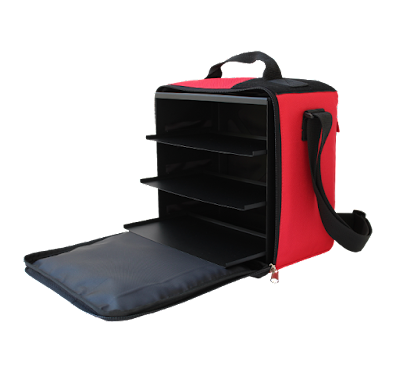 The case is lightweight, easy to assemble, metallic with magnetic mounting for your miniatures. Lightweight - Even though the case is mainly metal, due to the cut out framing, it is surprisingly light. Given I have been painting a bunch of Thousand Sons Tartaros, I thought I would quickly trow together some more marine Tactical Squads. One thing I did find missing from my Tactical Squads was their Sergeants. Luckily GW recently released their Thousand Sons Sorcerer boxed set with three sorcerors. They worked out really nicely as Sergeants for my three squads. I will have to make a scenic base for this one as the jumping fart the original miniature came with was a little to witchey-poo for 30k. I am tossing around the idea of making the claw-like appendages appear to be ghost-like. What do you think? And this is the Tactical Squad I recently stripped and now they are being repainted. And a few ForgeWorld Shoulder pads to go with them. Working on a bunch of Horus Heresy projects. First up is a Spartan Assault Tank. 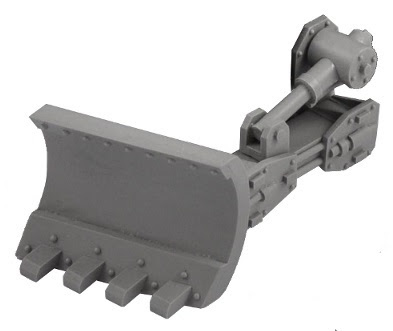 Now a lot of people love ForgeWorld kits, but I will have to make the comment that they don't always go together in a straight-forward manner. Make sure you have files, sanding paper, clamps, heat gun and a bunch of superglue. The kits really exercise your hobby muscles. What do they look like?Where do they fit to the chassis?What to do if you want to transport it? Well, I have a few answers for you. 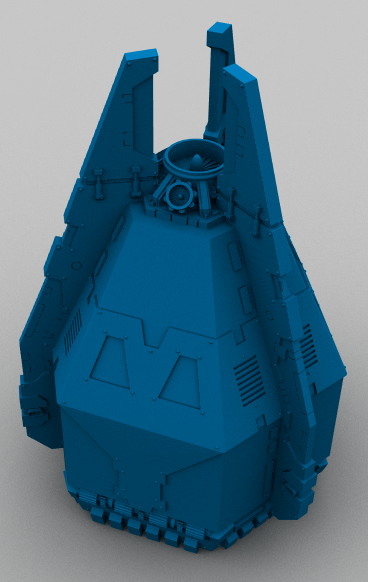 They are a four (4) part resin kit and should only be assembled in one way. Given there are no instructions, you should reference the pictures. because the dozer blade protrudes past the mounting bracket.